We'd walked past Nuevo Latino (facebook) a few weeks ago, and after checking out Kenny's review decided we had to pay a visit. The large windows give a good view inside, but there isn't much to mark the name. The fit out inside mixes a polished concrete floor and eclectic furniture with many homely and south American touches. Even with only a few diners present when we arrived at around 7:30 on a Saturday there was a nice atmosphere, and as it filled up and the band kicked off it built up quite a buzz. We were given a warm welcome by Jose Rodriguez, part of the family behind the venue as well as a couple of other members of the team. While checking out the menu we grabbed a couple of beers, an Estrella from Spain and my first Quilmes from Argentina which showed it's Germanic origins. We started by ordering a few of the smaller dishes, the first of which to arrive were two croquettes moros y cristianos, the crispy coating filled with a rice and bean mix which provided a satisfying earthy flavour and was nicely complimented by the mint and yoghurt dressing. Next up were the photogenic garlic king prawns with Aiguaste. The grilled crustaceans were fantastic and the 'Pepitas Pesto' a Salvadoran cuisine made from ground (pumpkin seeds) was a great addition which we mopped up with the bread that arrived at just the right time. We hit the menu again and we tried the Yuka chips (a first for us) which had a flavour somewhere between parsnip and potato and produced perfect fries, with a crunchy skin and soft interior and were served with a moreish spicy salsa. We'd tried to order the grilled corn kernels the first time around, and made sure we got some the second time around. The better half is a corn connoisseur and loved the dish, high praise indeed! We planned to have a main each, but they came separately, so we shared both. 'My' main was the tamale, steamed stuffed corn leaves, made to Mum's own recipe by her in the kitchen. The origins of the dish go back over five hundred years to pre-columbian times in south america, and are made with a corn dough similar to polenta with added chilli, spices nuts and chicken in this case. These were another new dish for us and we both enjoyed with the accompanying salsa and picked coleslaw. Last up was the other main plate, pupusaw a Salvadorian speciality of corn tortilla filled with quesillo soft cheese which was happily lighter than I expected and came with great re-fried beans, salsa and pickled veggies. All evening the service and team were friendly, Jose and the waiters chatted to us and everyone in the room. The band played creating a great atmosphere without overriding the dining experience. There are live acts every Saturday. The bill including five beers came in at $98, which given the amount we ate seemed like good value. 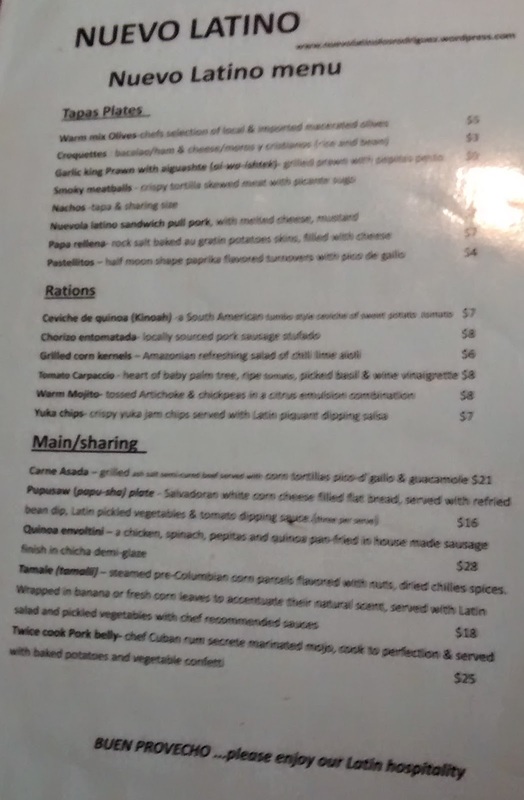 We really enjoyed our evening at Nuevo Latino, and can't wait to head back to West Footscray to try out more of the menu! The menu doesn't seem to be online so here is my snap of it.